President Obama just finished a landmark speech about domestic spying. And we�re very happy the president has finally recognized that the American people are tired of our own government spying on us and tired of being lied to about it. But do you know what we didn�t hear from him today? We didn�t hear that he will bring an end to the NSA�s dragnet surveillance programs. Today the president proposed a handful of incremental reforms, but unfortunately he missed this opportunity to stop all forms of bulk collection of innocent Americans� data. The good news is that over 55,000 of us have already signed the petition calling for Congress to rein in the NSA. And our voices have been heard�right now there�s a bipartisan bill pending in Congress that would roll back mass surveillance and it�s co-sponsored by 145 representatives and senators. But the bill�the USA FREEDOM Act� won�t even make it out of committee for a vote unless thousands more of us push them to act now. Can you take 3 minutes now to help us flood the inboxes of our representatives with our voices of support for the USA FREEDOM Act? Our allies in Congress have told us that each email our representatives receive increases the chances that the USA FREEDOM Act will make it through the difficult process of getting to the House and Senate floors for a vote. With the president�s speech, the momentum is swinging in our favor. But we need to act fast and make sure Congress gets the message. 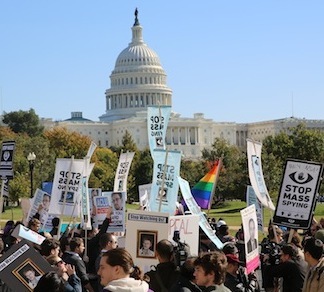 Let�s make sure the USA FREEDOM Act gets to the floor for a vote. Send your representatives an email now voicing your support for the bill. Thanks JL. Message signed, sent and post noted. "Thanks for Telling Your Members of Congress to Support the USA FREEDOM Act"
Message sent. Noted. Thank you for posting, JL!